First, the shopping. I am a clothes horse—and for the past few years when I have been unemployed/seriously under employed, I haven't bought any clothes—well, last winter I did buy some underwear—and I have knit myself socks, and some outerwear (1 sweater 6 years ago, another this spring) but mostly, I have been living off my collection—and as of late, some favorite pieces have been getting pretty threadbare! But this week, a local store (with a short term lease) has caught my eye.. ALL clothes (most, I am uninterested in) for $2.99. Still they had a collection of heavy twill (something like denim, but not indigo dyed) shirts--in a range of colors. I worked for a few hour this week—and will have blown most of my paycheck on clothing!--but I love basic clothing like this, and these heavy weight shirts are a style I wear and wear--and really 11 shirts for $33--its a bargain I couldn't pass by! Sometimes, I wear this type shirt as jacket, almost, (over a tee shirt), some times just as a long sleeve shirt. They are a bit heavy, even if they are 100% cotton, for the heat of summer, (ie, 90° days with high humidity) but perfect almost year round—the short sleeved ones are fine for any summer day that is below 80°--about half the summer here in NYC. one side, stripes of garter stitch, gthe other side, stripes in stocking knit stitch. 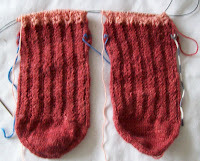 Double knitting is on my list of skills to learn, love what you have made. The shirts are fabulous, great buy.